← The Sports Archives – Eleven Essential Zlatan Ibrahimovic Facts! The Sports Archives – A Beginners Guide to Horseback Riding! Horse riding is often viewed as a hobby that can only be enjoyed by the rich, by those who are able to afford their own horse and all of the tack and clothing that goes along with it. While this is a common preconception horse riding is something that can be enjoyed by everyone, whether you can afford to buy your own horse or not, especially children. There are stables all over the country that offer riding lessons for children regardless of whether they will be investing in their own animal or not. So how do you go about learning to ride? Some people are scared of animals, and if you have never been up close to a horse before the sheer size of them can make you feel a little fearful, plus once you are in position in the saddle the ground can seem an awfully long way away. No matter what your gut response is you need to stay calm and maintain your composure. Just as a dog can sense fear, so can a horse. Not only can they feel your fear they can act upon it. No matter what you may be feeling inside you need to show the animal that you are confident, in control of your fear and in command of the beast itself. If you do find yourself having a fear reaction, take a moment to control your breathing and relax your body so that your fear reactions are not transmitted to the horse. 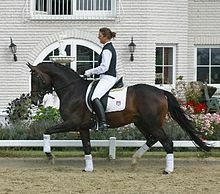 New and inexperienced riders are generally given a well trusted horse on which to take their first ride. You might not know what you are supposed to be doing but the house will. Despite everything you have seen in the cowboy films you don’t just jump up, kick your heels in and gallop off into the sunset. There is a skill to riding and leading your horse that you need to develop which uses pressure applied by your legs to the horse’s flanks to stimulate movement and use of the reigns to allow you to steer the animal where you want it to go. Until you are confident in controlling the animal you should not be left to ride alone. Before you take to the saddle ensure that you have the appropriate safety equipment, your horse has been well saddled and is calm. The majority of accidents that occur in this sport are directly related to the riders experience, with almost 90% of horse related falls and accidents occurring with inexperienced and novice riders. Check out the health and safety record of the local stables in your area, look at the kinds of lessons that they provide, pay a visit to the stables and voice any concerns you have before committing to riding lessons. Also, you should ensure that you are aware of any regulations that the stables may have in place regarding the provision of lessons such as acceptable age range. Looking to learn horse riding in France? Visit Dordogne Riding now. This entry was posted in Horse Racing, Other and tagged horse racing, horse riding, horseback riding, horseback riding lessons, sports and leisure, Sports Archives. Bookmark the permalink. 4 Responses to The Sports Archives – A Beginners Guide to Horseback Riding!